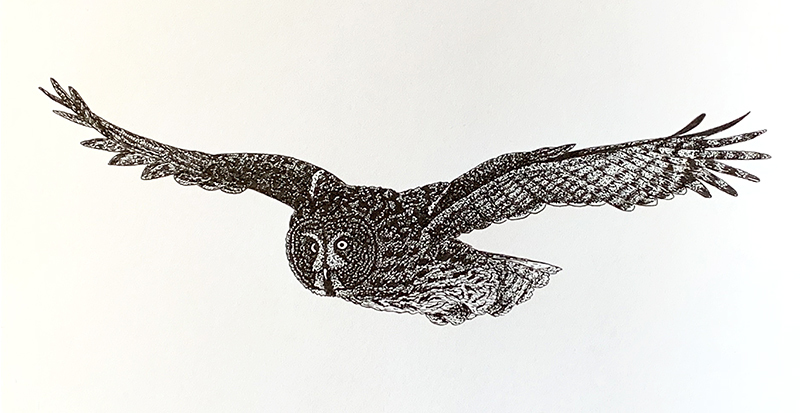 In February and March of this year, I drew a few Great Grey and Short-eared Owls to become more familiar with their face and wing markings and because looking at owl photos for an hour or two seemed like a really awesome way to spend my time. I’ve never seen a Great Grey out-and-about but I did catch a far away glimpse of a Short-eared Owl last October as it flew out of the Mill Creek South woods. 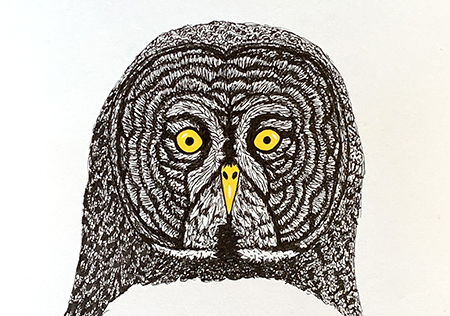 I started inking the Great Grey Owl in flight in March and set it aside with an unfinished wing when I moved in April. Inktober felt like a good time to finish it! Many thanks to Dennis Swayze for letting me use one of his beautiful photos as a reference. Dennis lives in Winnipeg, Manitoba and shares his bird photographs on his blog and on pbase. 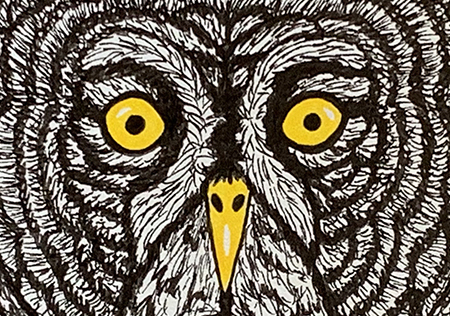 I think I’ll try drawing the owl again another day. His/her head is a bit too small and doesn’t look quite as fierce as it should. But I’m happy with my first try; it takes me a few drawings to notice all the important details. I also had some fun drawing a Great Grey head.